Cross Pollinate Productions in association with Norton Crumlin and Associates, present, JOURNEY'S END, by R.C. Sheriff, at the ATYP Studio, Wharf 4, Hickson Road, Walsh Bay, 15 - 22 October. Last year the Sydney Theatre and Music companies gave respect to the Centenary of the tragic events of Gallipoli Cove, during World War I, that has become the ANZAC tradition, with Commemorative performances. That terrible war began in August, 1914 and continued through to November, 1918. So, it is more than fitting that in 2016, we should be reminded that those commemorations of last year are just as urgently relevant today. That war of a century ago, has still many terrible events to be remembered and commemorated. And, for another two years - how long it was! The Western Front in France, concentrated for the British around Ypres and the Somme, became the stalemate zone of the war. The Battle of the Somme still ranks as the bloodiest battle in the history of warfare. In 142 days between July and November 1916, 1.2 million men were killed or wounded. JOURNEY'S END, written in 1928, by a war veteran of the Western front, R.C. Sheriff, is set in a support or 'cover' trench, in a Dugout, on the front line, for British officers - 'a stinking world of sticky, trickling earth'. It concerns the lives and deaths of a Division of soldiers, over several days, in the heated action of the war. I have seen this play several times before and although it concerns itself, principally, with the officer class of the British Army, and so has sometimes been criticised at its appearance as a class-ridden drama and thought to be somewhat dated - the compassionate and knowing observations of the pure humanity of the men of the story, coping with the stress and deprivation in a war zone, seems to supersede any skepticism one might have about the relevance or effectiveness of the thematics and story of JOURNEY'S END. Rather, it seems to me that the play has grown in stature as the years and many, many wars have passed and enveloped us. The contemporary images created by the Sport For Jove production of the two and a half thousand year old play, ANTIGONE, concerning a war between brothers in defence of ancient Thebes, sat uncomfortably familiar to me in the theatre setting in the ATYP Studio, for this other more 'modern' war. Samantha Young, the Director of this production, has sensibly created as naturalistic a vision of the world of the play with her Designers: Production (Set and Costume), Isabel Hudson; Lighting, Christopher Page; Sound Design, Alistair Wallace; as feasible within, likely, a small budget and the necessities of a war uniform and different era reality. Ms Hudson has created a world to support the action of the play, very successfully - no mean feat (although, I thought mud and dust was 'undervalued' and the war sounds of battle - particularly in the first half, seemed to be on a 'loop' regularity that undermined my belief of it's reality). Too, Ms Young has drawn some detailed and disciplined performances from all of her actors - the ensemble scenes having a veracity about them that never flagged. Of the principal characters, Jack Crumlin, as Stanhope, gives a mighty shape and truth to the collapsing officer-in-charge, with no indulgences and enormous empathetic compassion; with Sam O'Sullivan creating a reality of characteristics for Osborne that gives a perspective of 'depth' to the world of the play - dialect and all; while Alex Chalwell is convincingly naive as the young 'romantic' officer, Raleigh, just come to participate with his 'school-boy' patriotic duty. 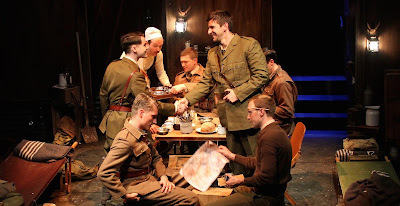 However, all the company give committed and convincing work to the play and its terrible sentiments: Aaron Tsindos (Trotter), Michael Wood (Hibbert), David Mason (Mason), Govinda Roser (McArthur), Patrick Cullen (Broughton), George Kemp (the Colonel) Luke Carson (Hardy/Crooks), Alex Beauman (German Soldier/Smith) and Oliver Crump (Rose). This is a very good production of a devastatingly human play. Its relevance is as powerful in 2016, as it was, undoubtedly, in 1928, where it played for almost two years in the London West End. By the end of that war 64,238,000 men had been mobilised. 8,501,000 had been killed. 21,189,000 had been wounded. As the Centenary of that war continues may commemoration of the experiences and legacies of that war be visited -Lest We Forget. Joan Littlewood's legendary OH WHAT A LOVELY WAR; FOR SERVICES RENDERED, by Somerset Maugham, soon?